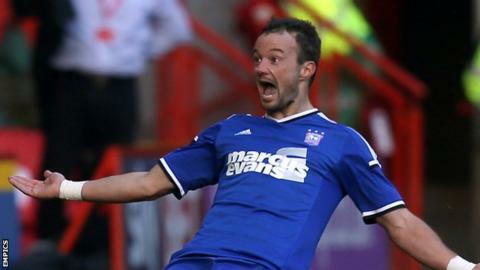 Noel Hunt has said his debut goal for Ipswich Town has come after a difficult time at parent club Leeds United. The 31-year-old had not scored in 22 games for United and ended a 22-month wait for a goal with Saturday's late winner against Charlton. "I haven't played for a long time," he told BBC Radio Suffolk. "You listen to a lot of nonsense and it starts to affect you, but you have to be mentally strong. I've worked as hard as I could behind the scenes." Hunt joined Leeds in the summer of 2013, but he had injury problems last season and later received criticism from some supporters after owner Massimo Cellino alleged he was earning £25,000 a week - something the player refutes. "Challenging is one word. My wife is superb, my brother and parents were on the phone telling me to keep mentally strong," he said. "I had a lot of nice messages from people at Leeds telling me I was one of the best pros, even though I wasn't involved." Hunt secured a one-month loan move to Town in the week and came on for the final seven minutes at the Valley at the weekend, scoring the game's only goal in injury time to lift Mick McCarthy's side up to second in the table. "They've had a lot faith in taking me here. I'm probably the most grateful man in the world," he said. "It's a small way of repaying them hopefully. "I'm here for a month. I'd absolutely love to stay longer, but it's down to the higher powers." The move also reunites him with brother Stephen, who has been at Portman Road for the past 12 months, after the Irish pair's spell alongside each other at Reading until 2009. "I didn't think I would play with him again. The move happened so fast. It was so surreal," said Hunt.